Mystery within Mystery: E. Burke Collins and "Dare the Detective"
Studies of dime novels frequently approach the material either by genre (such as detective fiction, westerns), as reflections of the culture that produced them, or, in recent years, through a feminist lens. One perspective only infrequently used is biographical, considering connections between an author's life and fiction, yet awareness of an author's background can provide additional context for understanding a work. In the case of dime novels, this approach may also allow examination of the effect of overlaying autobiographical elements on formulaic material. A look at "Dare the Detective; or, Told by the Dead" by E. Burke Collins, an early issue of Norman L. Munro's detective dime novel series Old Cap Collier Library, offers one example of the potential of this method. Traditionally, mysteries involve unveiling secrets, solving crimes by bringing deceptions and hidden elements to light. Using a biographical approach for "Dare the Detective" reveals that the first deception occurs on the cover with the author's name. Although the name appears masculine, the author was actually a woman, twice-widowed Mrs. Emma Skelton, whose first husband had been Emmett Burke Collins (and another mystery, still unsolved, is whether the E was intended to represent her first husband's Christian name or her own). 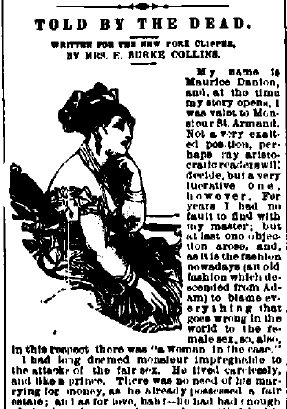 She used the names E. Burke Collins and Mrs. E. Burke Collins for her fiction, the vacillation perhaps indicative of the dual position many 19th-century women writers occupied, striving simultaneously to retain their femininity while forced to adopt a traditionally masculine role by earning a living. With "Dare," the decision to mask Collins's gender may also have been occasioned because she was writing in the predominantly masculine fields of dime novels and detective fiction. Collins's use of the name E. Burke Collins, is, however, also reflective of other aspects of her life and fiction. The name -- a partial pseudonym, since she was not, in fact, even Mrs. E. Burke Collins at this point -- concealed, altered, and yet also gave clues to her identity. Similarly, Collins regularly concealed certain aspects of her life and altered others when providing information -- or clues to her history -- for biographical sketches. Even when not in the mystery genre, her fiction often includes deceptions and disguises, plot reversals (in essence, revisions of established situations), and indications that all is not as it seems. It also places women in prominent roles, often in situations requiring them to assume a male character's responsibilities. 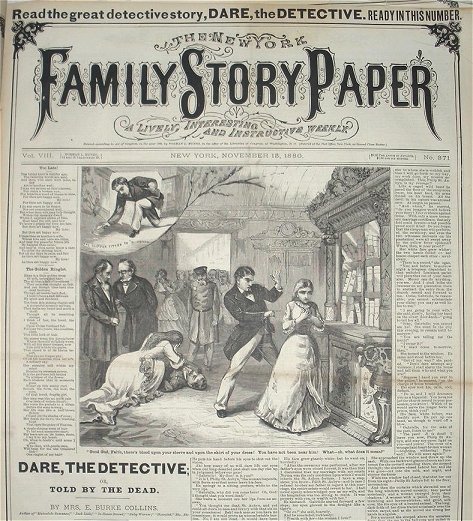 "Dare the Detective" -- a serious contender for most convoluted mystery ever published in OCCL (or elsewhere, for that matter) -- appeared on May 21, 1883, as number 7 in the series. It had originally been serialized under the same title in Munro's New York Family Story Paper from Nov. 15, 1880, to Jan. 17, 1881 (#371-380). Collins clearly draws on autobiographical elements for the opening scenes and several other elements. The story begins in her hometown of Rochester, where Philip St. Aubyn is unexpectedly confronted by a woman, Gabrielle. Gabrielle accuses him of marrying her then abandoning her on a small plantation in Louisiana and returning to Rochester -- a situation metaphorically paralleling Collins's own. Philip confesses that he has concealed their marriage and (bigamously) wed his cousin Norma to keep his family's fortune. Clutching proof that she is his legal wife, Gabrielle leaves. Sadly, she fares no better on her trip north than Mrs. Collins's first husband did in his move south: the next day she is found apparently frozen to death (a symbolic suggestion of the inhospitable climate?). Philip promptly destroys all evidence of their marriage, but he does not live long enough to enjoy his triumph: the following day, the servants discover his body. Darrell (Dare) Renshawe -- betrothed to the victim's half-sister Faith (who, like Collins in 1870, lives with her half-brother and his spouse) -- arrives to investigate and, to his horror, instead implicates Faith in the murder. Before Faith can be arrested, she, too, dies, and, along with Philip, is buried in Mt. Hope Cemetery, the same cemetery that housed Collins's relatives. Collins's knowledge of Louisiana institutions informs the next segment of the story, as the scene switches to the Office of the Parish Recorder in a small town in Louisiana. Jasper Jennings, overseer of Philip St. Aubyn's Louisiana plantation, tricks Silas Latham, the clerk, into leaving him alone with a volume holding records of marriage, then pours an ink-dissolving chemical onto Philip St. Aubyn's entry, essentially erasing the record of the marriage. Later, at the Lathams' home, Jasper meets with Gabrielle (who helpfully explains that a Rochester doctor "fancied he saw signs of life" and resuscitated her, then agreed "to keep it a secret") . Jasper tells Gabrielle "that in many portions of the South, it is the custom . . . for the officiating clergyman to present a certificate of the marriage to both the bride and the groom" (21). He has acquired the groom's certificate, the only remaining evidence of the marriage (which would allow Gabrielle to claim the St. Aubyn fortune for herself and her infant daughter). The last half of the story contains fewer recognizable autobiographical elements. It does include several key scenes at the train depot in the Lathams' small (unnamed) Louisiana town, suggesting some correspondence to Ponchatoula or Tangipahoa, both of which, in the 19th century, were stops on the Illinois Central Railroad (formerly the New Orleans, Jackson, and Great Northern Railroad). As in the story, the railroad connected those towns with New Orleans, and one of the memorable events in Ponchatoula's history was an 1862 train collision that left over 100 Confederate soldiers dead or injured. In "Dare," after leaving the Lathams' home, Gabrielle boards a southbound train that crashes near a small town -- which, if the Lathams were in Tangipahoa, would place the wreck near Ponchatoula. There she discovers her kidnapped daughter's grave, another association of loss with that location. A few details in the novel's final scenes, back in Rochester, again indicate Collins's familiarity with the city: when the text mentions that Dare's fiance, Faith (who, like Gabrielle and her child, was actually alive and in hiding) is in jail pending trial, it includes the actual name of the building, the Blue Eagle Jail. Several other elements, while not specifically tied to locations, nonetheless suggest autobiographical connections. One of the few times the narrative voice shifts into a direct address to the reader -- as if the narrator were speaking from experience -- occurs after Gabrielle learns her infant daughter is actually alive. Collins writes, "[Gabrielle] could only kiss the baby face and weep such tears as you mothers would shed, could your little one whom you had laid away under the sod a short time ago be suddenly and miraculously restored to your arms." (42) Here, as throughout the story, lovers and children who appear to have died and been buried are instead discovered alive and reunited with their families, the ultimate in wish-fulfillment for a woman who had lost a husband and a child. Also of interest is the resolution of the story: at the trial, Dare's sister Pearl -- the character who might be considered a stand-in for Collins -- falls into a clairvoyant trance. Dare persuades the court to allow Pearl to speak from her trance and she describes her vision of the crime. So powerful is her recounting of events that Norma, the murderer, confesses. Thus, ultimately, it is Pearl's ability to envision and describe a scene that brings about the successful resolution, just as it was Collins's ability to imagine and narrate an absorbing story that created a satisfying experience for her readers and led to her own success. Pearl's role also illustrates another element that distinguishes Collins's story from many of the other mysteries in Old Cap Collier Library -- the role of women. Despite the use of a male's name for the title, female characters dominate the narrative, and their actions frequently drive the plot: Gabrielle's appearance sets the story in motion; Norma's response -- murdering her husband and then working to conceal evidence and quash the investigation -- shapes much of the remainder of the work. Dare does not appear until halfway through the second chapter, and his investigation is surprisingly ineffective. Deciding to use technology (a masculine element), he hires a man to take a daguerreotype of the victim's retina, theorizing it will retain an image of the last person Philip saw, presumably the murderer. The result instead erroneously implicates Faith. Having botched the investigation and failed to protect Faith, Dare is borne "home to his mother's house" after Faith's funeral and "[f]or days he lay without speaking, scarcely moving," being cared for by his female relatives (10) . Eventually resuming the case, he is almost immediately imprisoned by Norma and spends the next nine chapters trapped while his sister Barbara pursues the investigation. (Indeed, as she captures Dare, Norma remarks, "a woman's wit is keener than a man's in an emergency like this" [p.12].) Dare finally reappears, only to spend most of the next ten chapters in disguise (and, although it is evident to anyone familiar with the genre that the mysterious Signor Ravelli is actually Dare, his identity is not actually revealed until the last three pages). One character who does know the truth about Dare's hidden identity is Barbara, just as, throughout the story, it is the female characters who possess crucial information or instinctively recognize the truth of a situation. Unlike the male detectives on the case, Norma and Faith are both aware of the identity of the murderer for the entire story. Similarly, unlike Dare's male co-workers, Barbara never doubts Dare's innocence and quickly begins investigating the true culprit, Norma. Pearl not only sees through the deception about Faith's death but also, at the trial, proves that a female clairvoyant's vision is a better gauge of the truth than the physical evidence assembled by the male detectives and prosecuting attorneys. Reading "Dare the Detective" with an awareness of Collins's life indicates that Collins drew on her own experiences when crafting the story, a trait evident in a number of her other writings as well. Familiarity with Collins's background thus offers another perspective for considering some of the authorial decisions in the novel -- everything from the choice of setting to plot twists and blending of genres and gender roles. While a biographical approach may require penetrating the identity behind a pseudonym, and, in some cases, reconstructing the life of a lesser-known author, it may also provide a useful angle for additional examination of a text. The author gratefully acknowledges the invaluable assistance of Lydia C. Schurman and J. Randolph Cox, without whose help this article would not have been possible. It was Dr. Schurman who first acquainted me with E. Burke Collins and generously shared her research material. J. Randolph Cox kindly provided a copy of "Dare the Detective" and additional information on dime novel research. Special thanks are also due to Tracie Meloy, Neal Kenney, and Gail Dotson of West Chester University's Interlibrary Loan office for locating copies of elusive newspaper articles and reference sources. 1. The Sept. 15, 1848, birthdate appears in Hal Hileman, Ancestry World Tree Project: Hileman Mail File 13 <http://awt.ancestry.com/cgi-bin/igm.cgi?op=GET&db=:3200703&id=I5432>. Emma Brown, age two, appears in the 1850 United States Federal Census, Rochester Ward 8, Monroe, NY; Roll M432_531, page: 375, image: 302, accessed via ancestry.com. Emma Brown, age twelve, is in the 1860 United States Federal Census, Rochester Ward 8, Monroe, NY, Roll: M653_783, page: 791, image: 319, accessed via ancestry.com. 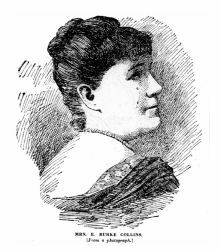 "Sharkey, Mrs. Emma Augusta," in A Woman of the Century: Fourteen Hundred-Seventy Biographical Sketches Accompanied by Portraits of Leading American Women in All Walks of Life, eds. Frances E. Willard and Mary A. Livermore (Buffalo: Charles Wells Moulton, 1893), also gives Collins's birthdate as Sept. 15, but the year as 1858 (646). 2. Hileman and the census records provide some information about the family members. The year of Collins's mother's death is listed in Mt. Hope & Riverside Cemetery Records, . 3. "Married." Rochester [NY] Union & Advertiser, Sept. 20, 1867: 3; John C. Bonnell, Jr., Sabres in the Shenandoah: The 21st New York Cavalry 1863-1866 (Shippensburg, PA: Burd Street Press, 1996): 58, 270, 300, 330, 367. 4. Collins's son is listed in Mt. Hope & Riverside Cemetery Records. 5. "Republican City Nominations," Rochester Union and Advertiser, March 4, 1870; the date of the 1867 campaign is from Rochester NY History - Monroe County (NY) Library System, Index to Newspapers Published in Rochester, New York, 1818-1897, "Book 13" [1851-1897 COA-COR]. 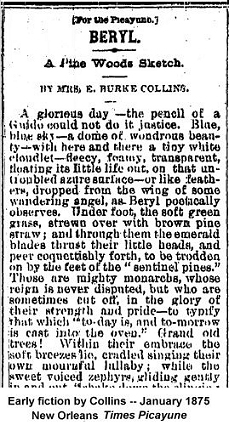 "E. Burke Collins," Rochester Union and Advertiser, March 4, 1870. For the Union & Advertiser's Democratic allegiance, see William F. Peck, Semi-Centennial History of Rochester (Syracuse NY: D. Mason & Co., 1884): 347-53. 6. "An Eighth Ward Republican, "The Republican Nomination for Alderman in the Eighth Ward." Rochester [NY] Union & Advertiser, 6 March 1866: 2. 7. 1870 United States Federal Census, Rochester Ward 8, Monroe, NY, Roll: M593_969, page: 380, image: 763, accessed via ancestry.com. 8. "Real Daughter 94 Years Old," Nebraska State Journal, 22 Aug 1908: 10; "Death of E. B. Collins," Rochester Daily Union & Advertiser, 19 Feb 1872: 2. 9. "Fatal Accident," Times Picayune, 13 Feb. 1872; "Crimes and Casualties," Troy [NY] Weekly Times, 24 Feb 1872: 2; "Death of E. B. Collins"; Aaron Zschau, "Collins Memorial,"
10. "Sharkey," A Woman of the Century, 646. 11. Louisiana Marriages, 1718-1925 Hunting For Bears, comp. [database on-line] , via ancestry.com; 1880 United States Federal Census, 8th Ward, Tangipahoa, LA, Roll: T9_471, enumeration district 182, image: 0784;via ancestry.com. "Died" [James F. Skelton obituary], New Orleans Daily Picayune, 10 April 1881: 6. Special thanks are due to the staff of the Louisiana Division, Special Collections, at the New Orleans Public Library for their help with research in their collection. 12. See, for example,"Notes," The Critic, 21 April 1888: 198; E[ric] B[raddon] [William J. Benners], "Emma Collins Sharkey," The Magazine of Poetry 6 (1894): 214; "Sharkey, Mrs. Emma Augusta," Herringshaw's National Library of American Biography, vol. 5 (Chicago: American Publishers' Association, 1914). Skelton is mentioned in Collins's obituaries, but since her death received so little notice that it is not included in any biographical sketches or cataloging records, the information essentially remained hidden. 13. See, for example, listings for Skelton (Emma, Justine, and William) and Robert Sharkey in Soards' New Orleans City Directories for 1882, 1883, 1887; for Sharkey in A Directory of Writers for the Literary Press, 3rd. ed. (Bangor, ME: W. M. Griswold), 1890; "Sharkey," A Woman of the Century, 647. 14. "How to Sell Stories," Inter Ocean, 22 Jan. 1888: 10; J. Randolph Cox, email, 19 May 2009, on the prominence of the papers. 15. [Emma Collins Sharkey obituary] Rochester Democrat and Chronicle, 23 May 1902: 4. 16. The serial was published as by Mrs. E. Burke Collins (J. Randolph Cox, email, 19 May 2009), again perhaps suggesting that the publisher felt the dime novel series was aimed at an audience that would expect a male author, unlike that of the "family" story paper. 17. Andrew Boyd, Boyd's Business Directory of Over One Hundred Cities and Villages in New York State, 1869-70. Albany: Charles Van Benthuysen & Sons, 1869. 18. 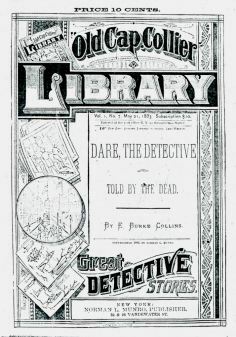 E. Burke Collins [Emma Augusta Brown Collins], "Dare the Detective; or, Told by the Dead," Old Cap Collier Library, vol. 1, no. 7, 21 May 1883: 20. All future references will be parenthetical in the text. 19. "Railroad Disasters," Daily Dispatch 10 March 1862: 1; "Jackson Railroad Report," [New Orleans] Daily Picayune, 16 April 1862: 2; Lawrence E. Estaville, Jr., "A Strategic Railroad: The New Orleans, Jackson and Great Northern in the Civil War," Louisiana History: The Journal of the Louisiana Historical Association 14.2 (Spring, 1973): 117-20. 20. The idea that a daguerreotype could reveal a murderer (and that it preserved the last image seen by the deceased) was briefly popular in the 19th century. The American Journal of Education and College Review 2 (1856), for example, reprinted a paragraph from the New York Herald to that effect (476). The concept also figured in a short story, Claire Lenoir, published in France in 1867 (Simon Ings, A Natural History of Seeing [W. W. Norton & Co., 2008]: 54). Whether Collins was familiar with the story is not known , but Gabrielle in "Dare" has a strikingly similar surname -- Le Noir (22). Collins was apparently intrigued by the concept of the revelatory retinal daguerreotype, for she also employed it in an earlier story, whose title was actually used as the subtitle of "Dare the Detective" ("Told by the Dead," The New York Clipper, 14 July 1877: msg. pg. ).